Fair warning: I am not an engineer. I’m not a scientist, either. I do make informal hypotheses and then use observational results to determine their merits, but using the scientific method does not make an expert. The truth is most contractors, builders, and even architects aren’t either of these things either. In fact, the whole idea of “building science” is a relatively new one, which is interesting, considering that humankind has been creating non-cave places to live for thousands of years. I use this as a preface because the home building industry makes an awful lot of its decisions based on what we’ve done before. Whether it’s a green behind the ears tradesman learning their craft from a veteran or one contractor picking up tips from another, this industry is based on handed down learning of what works and what doesn’t, with official code books issued periodically to provide continuous guidance on how homes should be built. While I’m not about to get into how codes are changed here, just know this: neither the codes themselves nor the jurisdictions who decide how and what codes get used (adopted, in the parlance) are done from a purely scientific standpoint. 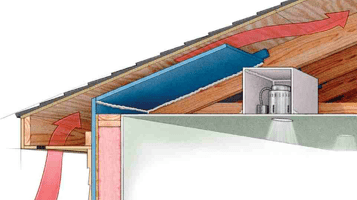 With all of this in mind, it should be little surprise that attic ventilation is a thing we do because we’ve always done it. And, even more maddening, is that the seemingly scientific way of determining how much attic ventilation a building needs was just made up back in the 1940s. So, as much as I’d love to post that using a ratio of 1:300, with 1 square foot of ventilation needed for every 300 square feet of attic area, with the ventilation balanced between the top (ridge) and the bottom (soffits or eaves) is the best solution to attic ventilation, I can’t say that it’s a 100% data driven fact. Yet, it works. Because of course it does. Funny, no? Attic ventilation, while important to do correctly, doesn’t cause catastrophic failure if done incorrectly. The original ratio, whatever its origins, was most likely based on observational data that correlated with homes that worked right. 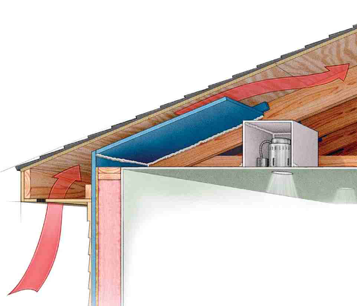 I will note that one of the most well-known and trustworthy building science professionals, Joe Lstiburek, does recommend using a 60/40 split for the bottom and top attic ventilation areas, with slightly more air coming in from the bottom of the space to slightly pressurize the space. This makes good sense, as it ensures that the attic won’t be “sucking” conditioned air from the living space. For practical purposes, we put this together 12 years ago. Note that the 1:300 ratio isn’t on here but, instead, there’s a multiplier. The .24 multiplier follows the 1:300 guideline but we’ve found that a simple multiplication factor is the easiest way to do the math. And, after 12 years, it’s probably time to update this with the 60/40 information as well. Otherwise, it all still works! Hopefully, this helps explain attic ventilation sizing some. As always, there’s more to the story, especially in how the practical aspects work, but we get to that another time.